New on OTPbooks.com this week: How would you scale down a pro training system for weekend warriors or keen amateurs in our 30s, 40s and 50s, with lots of experience, but also full-time jobs and families? Jeremy Hall, the editing author of The System book on periodization, works this out for us. I gave a talk at the NSCA in Kansas. It was a great experience. I went to Emporia State to see the Hall of Fame. I was impressed, well…Al Feurbach, of course, is in there…I am always impressed with the number (and variety) of track and field athletes enshrined in these midwestern universities. The local high school weightroom, Randy’s Place (!!!! ), is the dream of most of us. I love the presentations and took about 20 pages of notes. Since I can’t read my own handwriting anymore…I type them. I wish I would have done this a long time ago. I got back to my hotel in time to see the end of the Army-Navy Game. No matter how their seasons are going, it is always a great game. Let’s look at this week’s stuff I found on the Internet. I liked this article so much, I bought David Thompson’s book. “He was always looking for the little tweak, for the thing that would make him famous,” Sanderson said of Simonyi, who came from a family that included innovators and engineers. Here is my take from the ideas in this article…how do people NOT know this? • Eating few carbs, lots of healthy fat. Our dietary choices are hugely influential in our overall health, and perhaps nowhere else is this as evident as it relates to brain health. I limit my net carbs to around 30 to 50 g a day, and add in a lot of terrific fat in the form of extra virgin olive oil, nuts and seeds, and wild fish. I also supplement with the omega-3, DHA, 1000mg each day, as well as MCT oil, 1-2 tablespoons daily. This diet, along with the MCT oil, helps to create ketones, a specific type of fat that’s extremely beneficial for brain function and protection. • Supplementing here and there. Other supplements supported by good science include vitamin D, whole coffee fruit concentrate, turmeric, a good probiotic, and B complex. • Working out daily. Sure, we know that exercise is good for us and generally makes us feel good, but the extensive literature relating to higher levels of exercise to reduce risk of Alzheimer’s disease makes it clear that this is a lifestyle choice too good to turn down. So, I do at least 30 minutes of aerobic activity every day, including running, using an elliptical machine, or biking. Resistance training is also very important, and while I do favor free weights, I certainly spend plenty of time using machines as well. Finally, although I can’t specifically relate stretching to directly reducing Alzheimer’s risk, stretching can help reduce your risk of injury and therefore will help prevent you from getting sidetracked from your exercise program. Hopefully, there will come a day when scientists do develop an effective Alzheimer’s treatment. But for now, we’ve got to do everything we can to implement the science that supports the idea that to a significant degree, Alzheimer’s is a preventable disease. Last Monday in Chicago, San Antonio Spurs coach Gregg Popovich arrived at his pregame interview in the gloomy concourse of the United Center, the house that Michael Jordan built. So many of the league’s iconic highlights played out here in the 1990s, and those images seemed to be on Pop’s mind. In response to a ho-hum question about the state of the Spurs, Pop took the chance to lament the aesthetic of the NBA in 2018. “There’s no basketball anymore, there’s no beauty in it,” he said. It was a startling statement from the best coach of the era, whose own championship team from just five seasons ago played arguably the most beautiful version of the sport we’ve ever seen. Pop honed in: “Now you look at a stat sheet after a game and the first thing you look at is the 3s. If you made 3s and the other team didn’t, you win. You don’t even look at the rebounds or the turnovers or how much transition D was involved. You don’t even care. Jp92 from the Q and A forum added this article to our forum. As I was reading the article, Amazon arrived with a new book from one of the internet gurus. In many ways, the artist might be seen as the polar opposite of the guru. The artist (or at least some imaginary ideal of the artist) leans into reality—the dirt and grime of survival, the sullen, grim folds of the psyche, the exquisite disappointments, the sour churn of rage, the smog of lust, the petty, uneven, disquieted moments that fall in between. The artist embraces ugliness and beauty with equal passion. The artist knows that this process is always, by its nature, inefficient. It is a slow effort without any promise of a concrete, external reward. Boom. Short and to the point. This article has it right. I will be taking my whole family up to the Polar Express this Saturday night, our annual tradition. I will also be doing a lot of writing and thinking this week, too. Until next time, keep on lifting and learning. 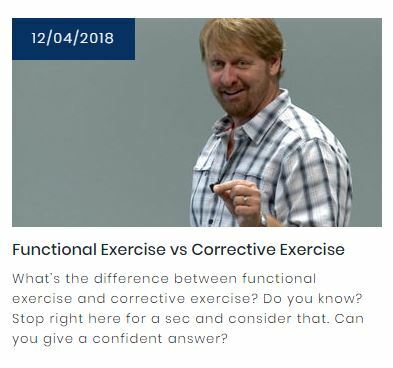 What’s the difference between functional exercise and corrective exercise? Do you know? Stop right here for a sec and consider that. Can you give a confident answer? “Come hither, come hither, come hither,” hummed Robin. The song ended in laughter. Robin, who had been twisting his brown fingers in the silk-fine threads which fell about his face, gave them a shrewd tug and scrambled to his feet. The best thing about this project for me, and from what I gather I may be the only audience, too, is that I dig deep into this material and discover so much more. I never knew…and I have read The Sword in the Stone countless times that this little song is actually from Shakespeare. Once again, T. H. White reflects his depth and breadth of literature here. Here is the original, from As You Like It, Act 2, Scene 5. Amiens contributes little to the story in As You Like It, but he sings two songs that push the story forward a bit. And bitterly take back the light they gave. The last to leave and still the first to come. They circle us like sleep or like the grave. Man with his sight and militant surmise. 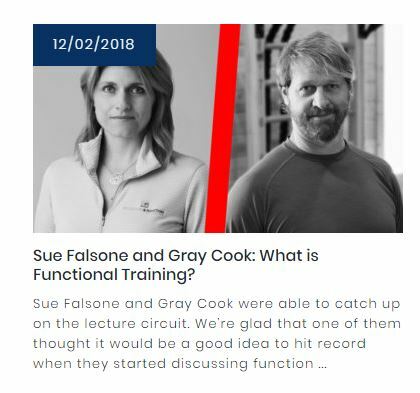 Sue Falsone and Gray Cook were able to catch up on the lecture circuit recently. We’re glad one of them thought it would be a good idea to hit record when they started talking. Click here to get this each Wednesday in your email box. Click here to see the Wandering Weights archive.